For spelling reform in English, see English language spelling reform. A spelling reform is a deliberate, often officially sanctioned or mandated change to spelling rules of a language. Proposals for such reform are fairly common, and over the years many languages have undergone such reforms. Recent high-profile examples are the German orthography reform of 1996 and the on-off Portuguese spelling reform of 1990, which is still being ratified by the different countries. There are a number of objectives which may drive such reforms: easing the task of children or immigrants becoming literate, making the language more useful for international communication, making etymology clearer, or for aesthetic or political reasons. Opposition to reforms is often based upon concern that old literature will become inaccessible, the presumed suppression of regional accents, the requirement to learn the new spellings, making etymology less clear, or simple conservatism based on concern over unforeseen consequences. Reforms that concentrate on removing unnecessary difficulties ought to take account of such arguments. Reform efforts are further hampered by habit and, in many countries, a lack of a central authority to set new spelling standards. Spelling reform may also be associated with wider discussion of what the official script should be, language planning and language reform. Orthographic reform may also be reverted. An example of this is Russian spelling reform of 1918 that was objected for political reasons by Whites who kept using the old orthography for propaganda posters and media. In languages written with alphabetic or syllabary scripts, one might expect there to be a close match of the script or spelling with the spoken sound. However, even if they match at one time and place for some speakers, over time they often do not match well for the majority: one sound may be represented by various combinations of letters and one letter or group of letters pronounced in various ways. In cases where spelling takes account of grammatical features these too may become inconsistent. People who use non-standard spelling often suffer from adverse opinions, as a person's mastery of standard spelling is often equated to his or her level of formal education or intelligence. Spelling is easier in languages with more or less consistent spelling systems such as Finnish, Serbian, Italian and Spanish, owing to the fact that, either, pronunciation in these languages has changed relatively little since the initial establishment of their spellings systems, or else that non-phonemic etymological spellings have been replaced with phonemic unetymological spellings as pronunciation changes. Predicting spelling is more difficult in languages in which pronunciation has changed significantly since the spelling was fixed, thus yielding a non-phonetic etymological spelling system such as Irish or French. These spelling systems are still 'phonemic' (rather than 'phonetic') since the pronunciation of a word can be systematically derived from the spelling, although the converse (i.e. spelling from pronunciation) may not be possible. English is an extreme example of a defective orthography in which the spelling cannot be systematically derived from pronunciation but also has the more unusual problem that pronunciation cannot be systematically derived from spelling. 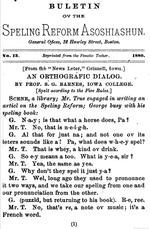 Spelling reforms have been proposed for various languages over the years; these have ranged from modest attempts to eliminate particular irregularities (such as SR1 or Initial Teaching Alphabet) through more far-reaching reforms (such as Cut Spelling) to attempts to introduce a full phonemic orthography, like the Shavian alphabet or its revised version, Quikscript, the latest DevaGreek alphabet, the Latinization of Turkish or hangul in Korea. Superfluity of graphemes (letters or characters) is often an issue in spelling reform, which prompts the "Economic Argument"—significant cost savings in the production materials over time—as promulgated by George Bernard Shaw. The idea of phonemic spelling has also been criticized as it would hide morphological similarities between words with different pronunciations, and thus obscure their meanings. It is also argued that when people read, they do not in reality try to work out the sequence of sounds composing each word, but instead they recognize words either as a whole, or as a sequence of small number of semantically significant units (for example morphology might be read as morph+ology, rather than as a sequence of a larger number of phonemes). In a system of phonetic spelling, these semantic units become less distinct, as various allomorphs can be pronounced differently in different contexts. For example, in English spelling, most past participles are spelled with an -ed on the end, even though this can have several pronunciations (compare kissed and interrupted). One of the difficulties in introducing a spelling reform is how to reflect different pronunciations, often linked to regions or classes. If the reform attempts to be absolutely phonemic in some model dialect, speakers of other dialects will find conflicts with their own usage. The need to decide between alternative proposals for the reform: it will not be possible to satisfy everybody. One may even end up with some regions or subcultures adopting the reform and others not. If spellings are moved to be closer to current pronunciation, then their etymology will be more opaque, and they will diverge from spellings of similar words in other languages, and also from the pronunciation of other dialects of the same language, making the text more opaque for speakers of those languages and dialects. Many technical terms are met more frequently in writing than in speech, so their pronunciation is largely irrelevant and should not be allowed to influence their spelling. Confusion during the transition period. 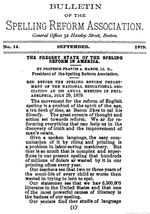 An 1879 bulletin by the US Spelling Reform Association, written mostly using reformed spellings (click to enlarge). An 1880 bulletin, written wholly in reformed spelling (click to enlarge). English spelling contains many irregularities for a number of reasons. English has generally preserved the original spelling when borrowing words; and even more importantly, English began to be widely written and printed during the Middle English period: the subsequent development of modern English included a Great Vowel Shift and many other changes in phonology, yet the older spellings, which are no longer phonetic, have been retained. On the other hand, many words were refashioned to reflect their Latin or Greek etymology. For example, for "debt" early Middle English wrote det/dette, with the b being standardized in spelling in the 16th century, after its Latin etymon debitum; similarly for quer/quere, which was respelled as choir in the 17th century, modelled on Greek χορός chorus; in both cases, the pronunciation was not changed. Modern English has anywhere from 14 to 22 vowel and diphthong phonemes, depending on dialect, and 26 or 27 consonant phonemes. A simple phoneme-letter representation of this language within the 26 letters of the English alphabet is impossible. Most spelling reform proposals therefore include multi-letter graphemes, as does current English spelling (for example the first two phonemes of "sheep" /ˈʃiːp/ are represented by the digraphs ⟨sh⟩, /ʃ/, and ⟨ee⟩, /i/, respectively.) Diacritic marks have also formed part of spelling reform proposals. Critics have claimed that a consistent phonemically based system would be impractical: for example, phoneme distribution differs between British English and American English; furthermore, while English Received Pronunciation features about 20 vowels, some second language varieties of English have 10 or even fewer. A phonemic system would therefore not be universal. A number of proposals have been made to reform English spelling. Some were proposed by Noah Webster early in the 19th century. He was in part concerned to distinguish American from British usage. Some of his suggestions resulted in the differences between American and British spelling. In the 1950s, the Language Reform Committee of the People's Republic of China devised the Hanyu Pinyin orthography and promulgated it as the official romanization system of mainland China. Since pinyin became the international standard for Chinese romanization in 1982, other romanizations (including the Wade-Giles system, Gwoyeu Romatzyh developed by Yuen Ren Chao, and Latinxua Sin Wenz) have become rarely used. The Republic of China on Taiwan continued to use Wade-Giles romanization until the turn of the 21st century, when the Tongyong Pinyin romanization was introduced. Tongyong Pinyin has been sporadically adopted throughout the island, and criticized for inconsistency. Hanyu Pinyin, the same system used in the mainland, was formally adopted in 2009. Dutch has undergone a series of major spelling reforms beginning in 1804 - with varying levels of official sanction and popular acceptance across the areas in which varieties of the Dutch language are spoken. The Dutch Language Union, founded in 1980 by the Netherlands and Belgium, is now the source of official reforms, and in 1995 issued the "Green Booklet" reform. In 2005 the spelling changed again. In 1990, a substantial reform ordered by the French prime minister changed the spelling of about 2000 words as well as some grammar rules. After much delay, the new recommended orthography received official support in France, Belgium, and Quebec in 2004, but it has not yet been widely adopted. The 2012 version of Larousse incorporates all of the changes. The 2009 version of Le Petit Robert incorporates most of the changes. There are 6000 words, which also includes words that were not originally included in the 1990 reform, for example, charrette or charette, based on chariot. As of 16 March 2009, several major Belgian publishing groups have begun to apply the new spelling in their on-line publications. German spelling was officially reformed in 1901 and certain older spelling patterns were updated: for instance some occurrences of "th" were changed to "t", the use of hyphens changed, and some instances of "c" were changed to "z". In 1944 another spelling reform was due to be introduced, but ultimately came to nothing because of World War II. Even though German spelling was already more consistent than English or French spelling, the German-speaking countries signed an agreement on spelling reforms in 1996; these were planned to be gradually introduced beginning in 1998 and fully in force by 2005. The so-called Rechtschreibreform was subject to dispute, and polls consistently showed a majority against the new rules. In summer 2004, several newspapers and magazines returned to the old rules. In March 2006, however, the most controversial changes of Rechtschreibreform were reverted. This caused German media outlets that had previously opposed the changes to switch to the new rules. The classical, medieval, and early modern polytonic orthography contained a number of archaisms inherited from Ancient Greek, which have been dispensed with or simplified in the modern monotonic orthography. See also Katharevousa. Indonesian underwent spelling reforms in 1947 and 1972, after which its spelling was more consistent with the form of the language spoken in Malaysia (i.e. Malaysian). The first of these changes (oe to u) occurred around the time of independence in 1947; all of the others were a part of an officially mandated spelling reform in 1972. Some of the old spellings, which were more closely derived from the Dutch language, still survive in proper names. The original Japanese kana syllabaries were a purely phonetic representation used for writing the Japanese language when they were invented around 800 AD as a simplification of Chinese-derived kanji characters. However, the syllabaries were not completely codified and alternate letterforms, or hentaigana, existed for many sounds until standardization in 1900. In addition, due to linguistic drift the pronunciation of many Japanese words changed, mostly in a systematic way, from the classical Japanese language as spoken when the kana syllabaries were invented. Despite this, words continued to be spelled in kana as they were in classical Japanese, reflecting the classic rather than the modern pronunciation, until a Cabinet order in 1946 officially adopted spelling reform, making the spelling of words purely phonetic (with only 3 sets of exceptions) and dropping characters that represented sounds no longer used in the language. Malay underwent spelling reforms in 1972, after which its spelling was more consistent with the form of the language spoken in Indonesia (i.e. Indonesian). These changes were a part of an officially mandated spelling reform in 1972. Some of the old spellings, which were more closely derived from the English language, still survive in proper names. Before Norway became independent in 1905, the Norwegian language was written in Danish with minor characteristic regionalisms and idioms. After independence, there were spelling reforms in 1907, 1917, 1938, 1941, 1981 and 2005, reflecting the tug-of-war between the spelling styles preferred by traditionalists and reformers, depending on social class, urbanization, ideology, education and dialect. The 2005 reform reintroduced several traditional spellings that had been abolished by the earlier spelling reforms. Little-used spellings were also excluded. The medieval spelling of Portuguese was mostly phonemic, but, from the Renaissance on, many authors who admired classical culture started to use an etymological orthography. In the early 20th century, however, spelling reforms in Portugal and Brazil reverted the orthography to phonemic principles. Subsequent reforms (Brazil, 1943 and 1971; Portugal, 1945 and 1973) have aimed mainly at three objectives: to eliminate the few traces of redundant etymological spelling that remained, to reduce the number of words marked with diacritics and hyphens, and to bring the Brazilian spelling standard and the Portuguese spelling standard (used in all the Portuguese speaking countries, except Brazil) closer to each other. The objective of unifying the rules of writing was finally achieved with a multi-lateral agreement in 1990, signed by every Portuguese-speaking country, but not ratified by Angola as of 2014. The implementation of the new rules in Brazil and Portugal started only in 2009, with a transition period of six years. The agreement is in use by the government and the teaching realms, as well as many of the press and publishing houses of both countries, and by state-related institutions. Because there are differences between the Portuguese spoken in Portugal and the Portuguese spoken in Brazil, the reform has led to the creation of new spellings that once were the same in both countries. None of the other Portuguese speaking countries that have signed the agreement have implemented it as of 2014. In Portugal there is still some resistance to it and in 2013 the Portuguese Parliament has created a work group to analyse the situation and propose solutions. During the transition period, four different spellings will co-exist: the official Portuguese spelling pre-reform (used in all Portuguese speaking countries in Africa, Asia and Oceania, as used in Portugal by the people), the official Brazilian spelling pre-reform (used in Brazil only), the Portuguese spelling after-reform (used by the government and its institutions, some media and publishers in translated books), and the Brazilian spelling after-reform (used by the government, media and publishers in translated books). The latter two systems are regulated by the same agreement, but differ somewhat because of different pronunciation of the same words in Portugal and Brazil. Over time, there have been a number of changes in spelling. They mostly involved the elimination of the (purely etymological) Greek letters that had been retained in the Cyrillic script by reason of ecclesiastical tradition, and those rendered obsolete by changes in phonetics. When Peter I introduced his "civil script" (гражданский шрифт, graždanskij šrift) in 1708, based on more Western-looking letter shapes, spelling was simplified as well. The most recent major reform of Russian spelling was carried out shortly after the Russian Revolution. The Russian orthography was simplified by eliminating four obsolete letters (ѣ, і, ѵ, and ѳ) and the archaic usage of the letter ъ (called yer, or hard sign) at the ends of words, which had originally represented a vowel with a sound similar to schwa, but had become silent by the Middle Ages. Within the South Slavic languages, which form a dialect continuum, the Serbo-Croatian language itself consists of four literary standards: Serbian, Croatian, Bosnian and Montenegrin. It went through a series of major spelling reforms in the early to middle 19th century. Up until that time, two distinct writing traditions had evolved. Western dialects had been written using the Latin alphabet, while eastern (Serbian) had been using an archaic form of the Cyrillic script. Despite several attempts, there was no universally agreed-upon spelling standard employing the Latin alphabet, and the Cyrillic version was considered outdated. A series of reforms have been undertaken to establish the standards, in order to bring the writing system to parity with spoken language. The reform movement was spearheaded by Croatian linguist Ljudevit Gaj for the Latin-based writing system, and Serbian reformer Vuk Stefanović Karadžić for the Cyrillic version. The reform efforts were coordinated in order to correlate the two writing systems, culminating in the Vienna Literary Agreement in 1850. The system thus established has remained in service since. The Slovene language, not a part of the Serbo-Croatian dialect continuum was also covered by the same reform movement. After the Second World War and the codification of the Macedonian literary language, the same system has been extended, with some modifications to it as well. All of these writing systems exhibit a high degree of correspondence between language sounds and letter characters, making them highly phonetic and very consistent. Another South Slavic language, Bulgarian underwent a spelling reform in 1945, following the Russian model. The Spanish Royal Academy (RAE) reformed the orthographical rules of Spanish from 1726 to 1815, resulting in most of the conventions now used. There have been several initiatives since then to further reform the spelling of Spanish: Andrés Bello succeeded in making his proposal official in several South American countries, but they later returned to the standard of the Spanish Royal Academy. Another initiative, the Rational Phonetic Hispanoamerican Orthography (Ortografía Fonética Rasional Ispanoamericana), remained a curiosity. Juan Ramón Jiménez proposed changing -ge- and -gi to -je- and ji, but this is applied only in editions of his works or his wife's. Gabriel García Márquez raised the issue of reform during a congress at Zacatecas, and drew attention to the issue, but no changes were made. The Academies, however, change several tidbits from time to time. Armenian: See Spelling reform of the Armenian language 1922–1924. Bengali: Ishwar Chandra Vidyasagar removed several archaic letters used for writing Sanskrit loanwords (ৠ, ঌ, ৡ, ব) and added three new letters (ড়, ঢ়, য়) to reflect contemporary Bengali pronunciation. Catalan: The spelling of the Catalan language was standardized, mostly by Pompeu Fabra in the early 20th century. Chinese: Simplified Chinese characters replaced traditional characters in Mainland China, Malaysia and Singapore, although traditional characters are still used in Taiwan, Hong Kong and Macau. Czech: The spelling of the Czech language was reformed and regularised as early as the 15th century through the publication of the manuscript Orthographia bohemica. Danish: There were spelling reforms in 1872 and 1889 (with some changes in 1892). In a 1948 reform, the Danish language abandoned the capitalization of common nouns (originally a German-inspired rule) to align with the other Scandinavian languages. At the same time, the digraph Aa/aa was abandoned in favor of the Swedish letter Å/å. The double-a digraph is still widely used in personal names and is optional in a few placenames. In 1980, W was recognized as a distinct letter. Before that, it was considered a variation of V for purposes of collation. Georgian language: In 19th century Georgian alphabet underwent removal of five letters (ჱ, ჳ, ჲ, ჴ, ჵ). Hebrew: The Hebrew language has two systems of spelling – with and without vowel marks, called Niqqud. Niqqud is used consistently only in books for children, poetry, and some textbooks and religious literature. Most other texts are usually written without vowel marks. The Academy of the Hebrew Language publishes rules for both vocalized and unvocalized spelling. The latest major revision to the rules of unvocalized spelling were published in 1996, although in practice they are not mandatory. To date there is no standard spelling for unvocalized Hebrew, and many Hebrew speakers spell according to their own instinct and custom. [dubious – discuss] See Hebrew spelling. Korean: The hangul alphabet replaced hanja ideograms in the Korean language. Latvian: Old versions of Latvian orthography were German-based, they were replaced by a more appropriate system at the beginning of the 20th century. The Latvian language discarded the digraph Uo in 1914, the letter Ō in 1946, and the letters Ŗ and Ch in 1957. Swedish: The last major reform of Swedish orthography occurred in 1906. It homogenized the spelling of /v/ and changed the adverbial and neuter adjectival ending -dt to -t or -tt depending on the length of the preceding vowel. The phrase hvarken af silfver eller rödt guld was now spelled varken av silver eller rött guld. Some people had called for an even more radical reform that would also homogenise the spellings of the /j/, /ɕ/ and /ɧ/ sounds, which to this day remain highly diverse in Swedish. Turkish: The Turkish alphabet replaced the Ottoman Turkish script in the Turkish language. Venetian: The Venetian language has never had an official orthography, because it was considered a dialect until recent times, and also now many don't consider it as a "distinct" language. Many others languages of Italy are in the same situation. Anyway, there are some attempts to establish a standard orthography for Venetian, like the Grafia Veneta Unitaria ("shared Venetian spelling"), a spelling created by a committee convened by the region Veneto in 1995. Vietnamese: In the Vietnamese language, the Vietnamese alphabet replaced the earlier Nom system in the 1920s. ^ Oxford English Dictionary, 1st edition, ss.vv. ^ "Turkey - Language Reform: From Ottoman to Turkish". countrystudies.us. Retrieved 2 January 2019. The Nooalf Revolution Provides an English-based international spelling system.